Another year of a birthday and Christmas has come and gone. Since it was a milestone year for me, I was asked, a lot, what I'd like for both occurrences. Tastes have changed. There are things which I'd like. Then, I look at them and think of upkeep and whether they need to be dusted and they fall off the list. Three things which don't are tea, chocolate and socks. 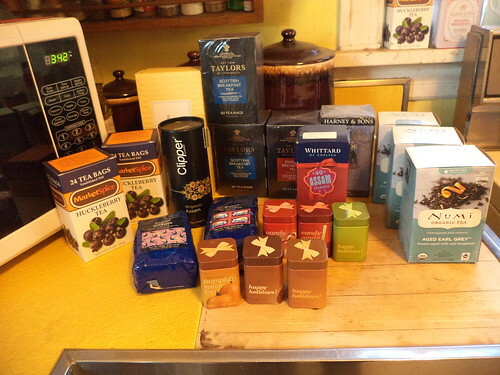 I got a lot of tea for birthday and Christmas. I dumped all Christmas and birthday gifts into a box sitting in the recliner and, over New Year's, put it all away. I also emptied and cleaned, the cupboards in the kitchen. No lie. There was an angel food cake mix with a "Best By 4-18-12" date on it. Not going to even attempt to use that. In cleaning, I found packages of tea which had been shoved to the back of the cupboard when pasta or soup or olive oil had been added in front of them. I always think I don't have enough. I pulled everything off the shelves and was astounded. This doesn't take into consideration the boxes which are in active use and repose on the window sill behind the stove, two of which can be seen at the upper right of the photo. After taking this, I found another small box of Christmas gifts which included three more boxes of tea. I used the last tea bag in the Huckleberry tea sitting on the corner of the window sill and replaced it with a box of Irish breakfast Carole gave me. This is a lot of tea. A practical assessment is in order here. I drink a lot of tea. I have a large mug of Assam to my left as I type this. At the office I know I have four different varieties. Even if I use one tea bag a cup or one strainer of loose leaf, it will take me over a year, probably closer to 2 years, to use up all of this. I never do a 'one-off' of a bag. I usually get three mugs out of one before I pitch it. Hence, we are, realistically, looking at over 3 years of tea sitting on the counter. What's also not shown are the containers of hot cocoa, both the cocoa which can be made with water and the cocoa which needs milk. I drank a lot of cocoa last week, when the temperatures dropped into the single digits during the day and negative numbers at night. It's probably time to stop asking for tea as a gift.